After settling into our rooms Monday night, I think we all got a good night's sleep. The tour company employs hallway monitors overnight and the report was, "this is a quiet" group. Either quiet or simply exhausted, I'm not sure. Regardless, after a buffet breakfast, we headed to Mt. Vernon. The neighborhoods we passed along the way were lovely. Nestled in trees and peaceful looking. And Mt. Vernon is no different. When I came here with LPP, the sun was shining and the views magnificent. While the rain kept the views from being seen, this place is still pretty special. The Mt. Vernon Ladies Association, who rescued the estate in 1858 have been lovingly restoring and caring for it ever since. It would have been such a loss had they not. The home is large but is comfortable. It feels welcoming and not ostentatious. I would have been quite happy being a guest here. The main key to the BASTILLE. And the bed on which President Washington died. After a quick lunch stop, we meandered through the streets of Alexandria back to Washington DC. Vinnie pointed out so many homes and places from our history. Christ Church where George Washington worshipped. Captain's Row where the cobblestones are made from ballasts. We were to now go on our "official tour of the Capitol". The one everyone goes on. We met our young guide who is from California. 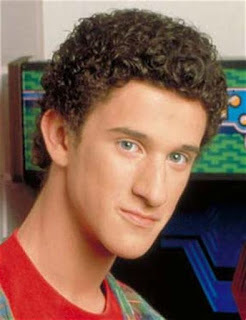 And reminded me of Screech on Saved By the Bell. We was very sweet and eager to share everything he knew. There is always something new to see and learn about here. Once our guided tour was over, we were led into a large, beautiful office. The kidnicks sat around a long table while drinking sodas that had been placed out. The very same table where the Crown Prince of Saudi Arabia sat mere hours earlier. 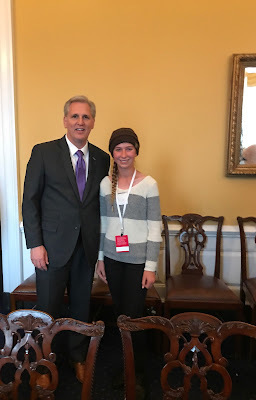 We waited for just a few minutes when the House Majority Leader walked in. He asked the students questions and then told the story of the painting in his office. It is on loan from the artist Steve Penley and depicts Washington's Crossing of the Delaware. It seems to show a variety of ethnicities which make up our country as well as a woman. "All of America in the same boat. Paddling together"
The Congressman was generous with his time and was gracious enough to take individual photos with all who wanted. 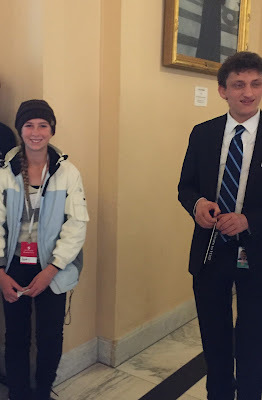 Once outside the Capitol, we trekked across the street to allow the student to visit another Congressman's office. We took the kidnicks in shifts up to Congressman V's office. Much more compact than the Majority Leader's. Imagine the Congressman's surprise when he opened his door to walk in and was greeted with a roomful of people. He smiled and shared with the students items that he had on display. He also took the time to pose. The following monuments were visited the following day...I think, but re-uploading the photos is not something I desire to do again, so bear with me. We visited the Jefferson Monument. The cherry trees surrounding it were not quite in bloom yet and I can only imagine how stunning it is then. We visited the Vietnam Memorial which is powerful, although I think visiting it during the day is my preferred choice. Walking through the Korean Memorial is emotional and almost eerie...which is the point, I reckon. 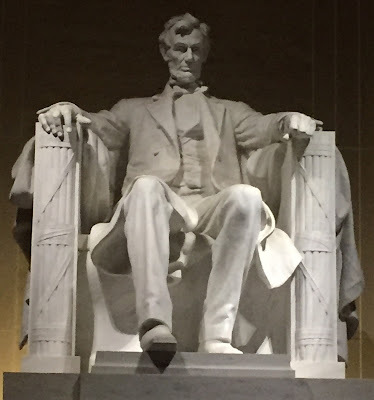 The Lincoln Memorial is simply awe-inspiring. Vinnie had the students try and locate a mistake that was made in the engraving. An early night back at the hotel allowed the kidnicks to enjoy the swimming pool for a bit before bed. And to scope out what was in store for us the following day. A great post. My husband used to work at the White House and we lived in the "burbs". Mt Vernon is my favorite place to visit, but there are so many great places in D.C.